All around the world people are celebrating the Easter holiday. Some places have a unique way of celebrating this time Holy holiday. Here is a list of some of these unique celebrations. 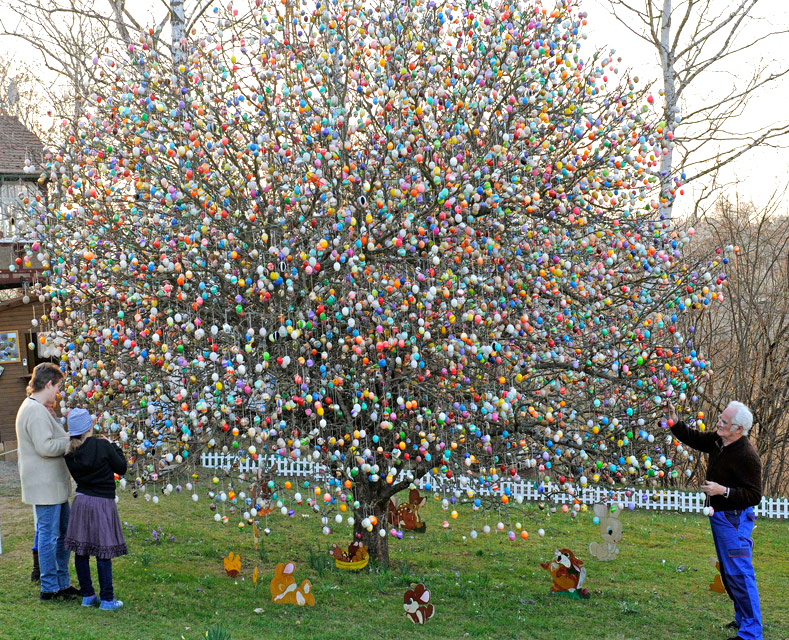 Volker Kraft decorates a tree with 10,000 Easter eggs in the garden of the retired couple Christa and Volker Kraft in Saalfeld, Germany, March 21, 2012. The Kraft family has been decorating their tree for Easter for more than forty years. Kraft’s apple sapling sported just 18 eggs when he first decorated it for Easter in 1965. Kraft has reached 10,000 – and he says he’s stopping there. People buy fish at the Villa Maria del Triunfo fish market during Holy Week in Lima, Peru. 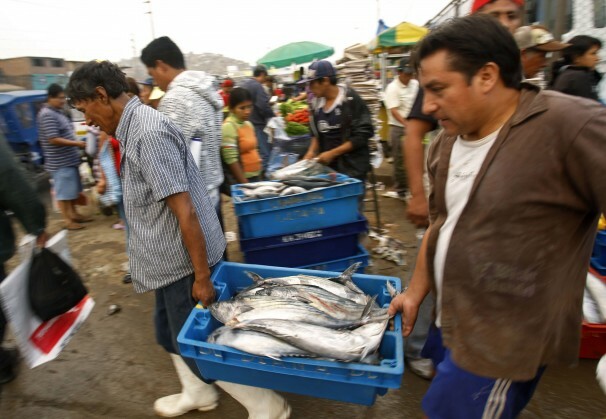 Most Peruvians are Catholic and consume fish during Easter week, a time when vendors as much as double their prices, according to a shopper at the market. On Good Friday, many people prepare “The Seven Dishes,” but it is traditional to cook different recipes using only fish. Polish miners mark Good Friday by staging their own celebrations underground at the Wieliczka Salt Mine. 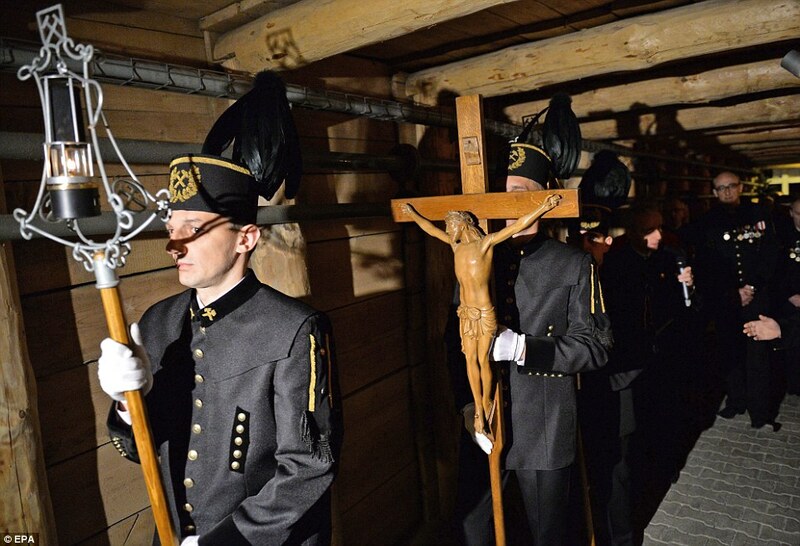 A procession known as the Underground Way of the Holy Cross takes place, with miners donning ceremonial uniforms and marching to a salt monument of Pope John Paul II in the underground Kinga Chapel. The Wieliczka Salt Mine is one of the oldest known salt mines of the world and has been designated a UNESCO World Heritage site since 1978. The Kinga Chapel lies at some 318ft underground and tourists can visit on organised tours to discover the underground town created by the miners, complete with lakes passages and the chapel itself. 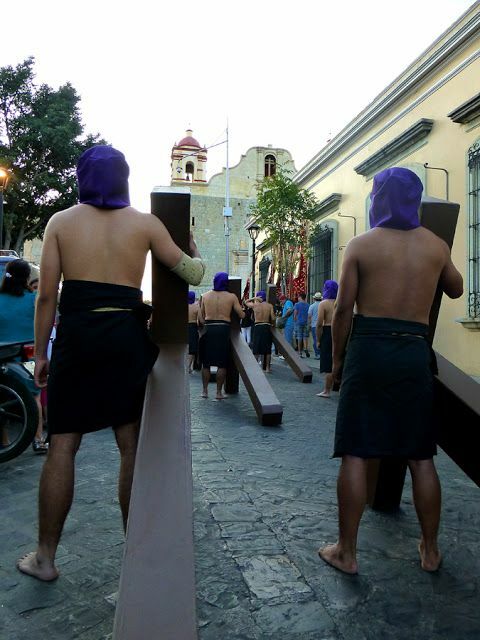 For San Luis Potosi, Mexico, the city’s most iconic tradition takes place on Good Friday, it’s known as the Procession of Silence. Nearly 2,000 people from more than 25 guilds come together to participate in the procession, which starts at dusk. The entire ceremony is done in silence with dimmed street lights, as guilds make their way to Plaza del Carmen, carrying various religious emblems related with the passion and death of Christ. The Buenos Aires Christian theme park is dedicated entirely to telling the story of Jesus and during Easter this Argentinian attraction goes into overdrive. With a plastic Jesus who is resurrected every 60 minutes and plastic statues depicting the Passion, it is already a must-see attraction for the devout, with hundreds gathering each hour to watch the statue emerge from a rocky outcrop to survey the crowds. 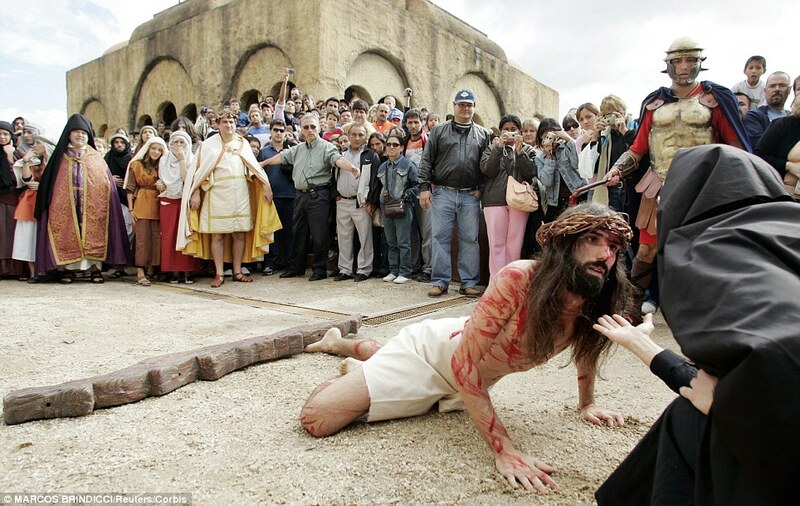 During the Easter weekend, actors take up the role to bring the passion to life, carrying the cross through the park and being crucified by Roman soldiers. The attraction is a huge hit with Latin American tourists, who travel from miles around to come and see what is billed at the world’s first religious theme park. Traditional marches take place throughout Spanish towns and cities to mark Holy Week – the last week of Lent, attracting tourists from around the world. 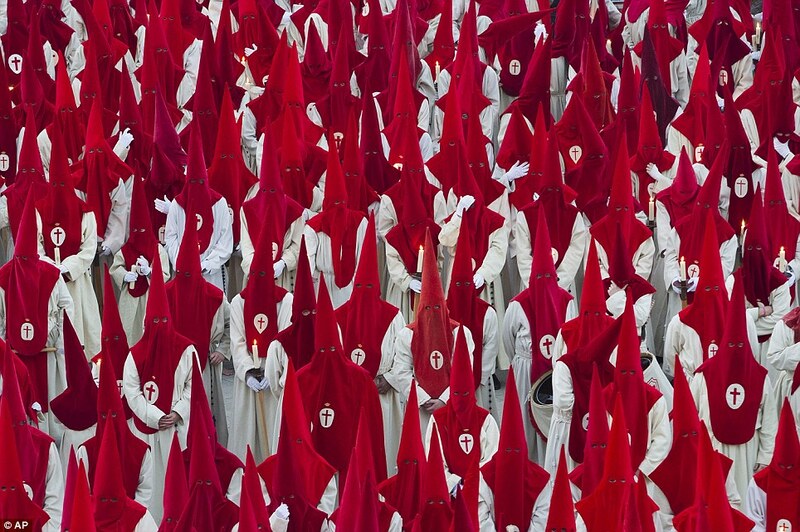 The ‘penance processions’ through the streets are performed by Catholic religious brotherhoods who wear different coloured robes to tell themselves apart. They also don conical hoods for the haunting processions as they carry life-size effigies of Jesus Christ and the Virgin Mary accompanied by dramatic drum beats and mournful music. Traditionally these hood maintained their anonymity. The sobriety of the processions varies during Holy Week, from the quiet El Silencio march in the early hours of Good Friday to more celebratory, musical processions to celebrate Christ rising again. Up to a million visitors head to Seville for Holy Week (known as Semana Santa in Spanish), collecting programmes of the varying processions and following them through the city. The tradition dates back to the Middle Ages when penitents would be dressed in the robes before walking through the streets. It is believed that on Good Friday bells from churches in France fly off their respective buildings to the Vatican, carrying all of their town’s grief from mourning Christ. Then these bells return home on Easter morning to ring in correspondence with the resurrection of Christ. 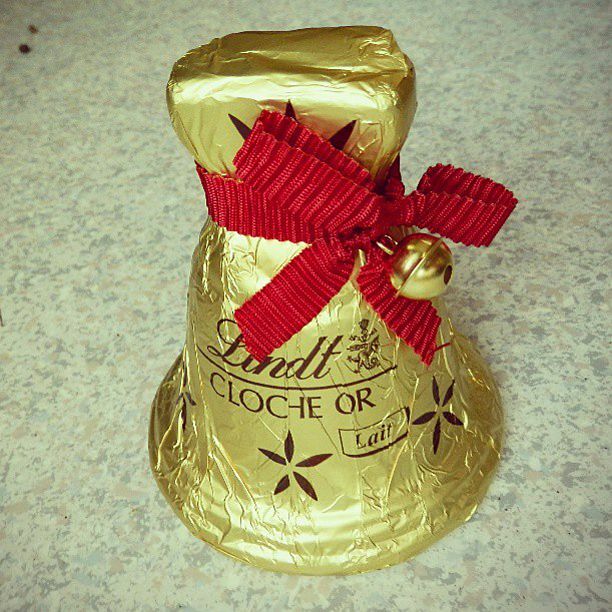 Even today, this tradition is upheld as church bells refrain from ringing until Easter morning, when chocolate candy bells are distributed to celebrate. Chocolate candy bells symbolize the Easter holiday all over France. In Slovakia, over Easter weekend, can expect to be whipped with willow branches and doused in water, but it’s all good fun and actually performed with the aim of making women more beautiful and healthy. The folk custom, once believed to purify the soul and body, predates Christianity, which arrived in Slovakia in the ninth century but became intertwined with Easter traditions as history passed. The practice used to be seen across the whole country, but died out somewhat under Communist rule in the late 20th century. Now in bigger cities, women tend to be sprayed with scented water. However, in smaller towns and villages, women can still expect to have buckets of water poured over them, be playfully whipped with decorated branches and even thrown into the local river by some over-enthusiastic males. Centuries old, the tradition of the “Scoppio del Carro” in Florence, Italy, takes place during Easter in the square in front of the city’s Basilica di Santa Maria del Fiore. The cart is typically adorned with ribbons and pulled by two oxen from Porta al Prato to the square. a mechanical dove is fixed on an iron wire inside the cart and throughout the clergy’s procession to the Baptistry; it slides up and down the wire. At midday, the dove leaves a trail of smoke in its wake down the central nave, or central body of the church, of the Duomo until it reaches the cart where it ignites firecrackers. 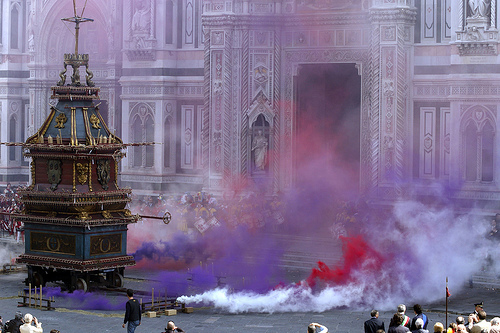 After the dove’s return to the cart, smoke appears as loud whistles ring out across the church and eventually a explosion occurs and four banners appear with the insignia of the city of Florence, the Pazzi family, the ‘Arte della Lana,’ or wool guild of the city, and the United Nations Organization emblem. With their bare backs covered in blood and their faces hidden by hoods, devoted Catholics in the Philippines atone for their sins by taking part in this tradition. The barefoot penitents walk through the streets whipping themselves or with pointed wooden sticks tied to their arms as they take part in the rituals to atone for their sins, seek a better life or give thanks. Every year thousands of foreign and local visitors line the streets to watch the rituals in San Fernando, north of Manila, and the suburban Mandaluyong, to the east of Manila.